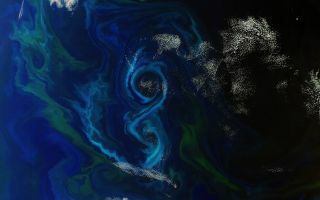 An algae bloom in the shape of a figure 8 in the south Atlantic Ocean. This cool space wallpaper shows microscopic algae create a bright blue figure 8 in a new photo snapped by a European Earth-observing satellite. Photosynthesizing micro-organisms called phytoplankton created the figure 8 in the south Atlantic Ocean, about 360 miles (600 kilometers) east of the Falkland Islands. The European Space Agency's Envisat spacecraft acquired the image on Dec. 2, 2011.